Point of access DNA sequencing technology which can save lives through faster, more accurate diagnosis. DNAe is developing its pioneering semiconductor DNA sequencing technology for healthcare applications where rapid near-patient live diagnostics is needed to provide actionable information to clinicians, saving lives by enabling the right treatment at the right time. In January 2015 DNAe acquired nanoMR, Inc. (now DNA Electronics Inc.), a developer of a novel system for rapid isolation of rare cells in the bloodstream. DNAe is developing LiDia®, its sample-to-result genomic analysis platform, combining DNA Electronics Inc.’s Pathogen Capture System with its own portfolio of semiconductor-based genomic technologies, trademarked Genalysis®. The LiDia® range of tests will enable DNA analysis directly on a microchip, providing rapid and accurate results from a user-friendly system. DNAe’s initial focus is on infectious disease diagnostics, where speed and DNA-specific information can make the difference between life and death. LiDia® will launch with the LiDia® Bloodstream Infection (BSI) test, a groundbreaking rapid direct-from-specimen test for bloodstream infections that lead to sepsis. 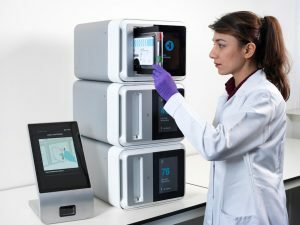 Built into a compact device for use at the point of need, the system will diagnose accurately and rapidly what infection a patient has, providing the clinician with actionable information to help select the appropriate antibiotics to treat the disease. A private company, with bases in London, UK and Carlsbad, CA, USA, DNAe has strong financial backing from its investors, including major shareholder Genting Berhad, a Malaysian-based global investor with a growing portfolio of cutting–edge life sciences companies.